This is my entry to the monthly food blogging event Sugar High Friday (SHF). Initiated by the baking diva Domestic Goddess, this edition (which the 6th, BTW) is hosted by Debbie of Words To Eat By. SHF is a community effort of food bloggers from all over the world wherein the post in their blog at a certain date is of the theme set by the host. This 6th edition has the theme of caramel. Also, SHF is a spin-off from the highly successful and original food blogging event Is My Blog Burning? (IMBB), started by Alberto of Il Forno. Okay on with the recipe, I found this recipe from the 101 Cakes & Bakes cookbook published by the BBC GoodFood Magazine. 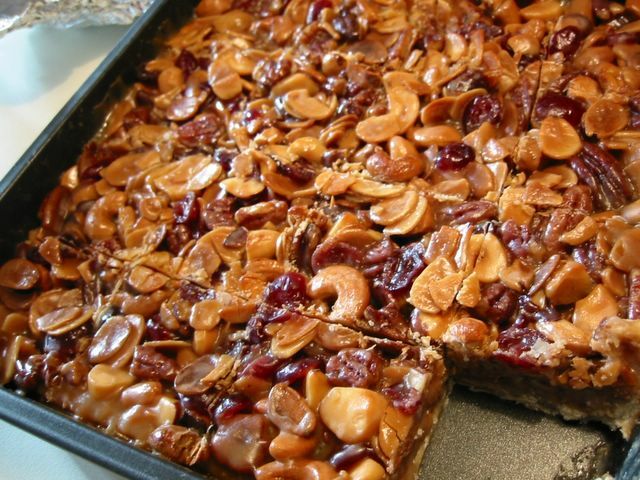 It was originally named Margaret's Caramel Nut Squares in honour of the chef who created it - Margaret Fineran. However, I decided to change it to Honey Caramel since the flavour of the honey is very dominant. into the flour mixture with a pastry cutter until crumbly. Mix the vanilla and beaten egg; add to the flour mixture. Stir until the mixture comes off the side of the bowl. Form the dough into a ball and knead a little. Wrap in cling film and chill for 30 minutes. Roll out pastry dough on a lightly floured surface or floured greaseproof paper and use to line a 23cm/9-inch square pan. Bake for 7 minutes. Heat the butter and double cream in a saucepan until hot. In another saucepan, put the sugar and honey and bring to boil without stirring. When the sugar mixture is boiling, pour the hot cream mixture in it and simmer while stirring for 2-3 minutes. Mix in the nuts and cranberries to the saucepan. Spoon the whole lot into the hot pastry case. Return to the oven for 7 minutes. Remove, cool, then cover and freeze for 3-4 hours. 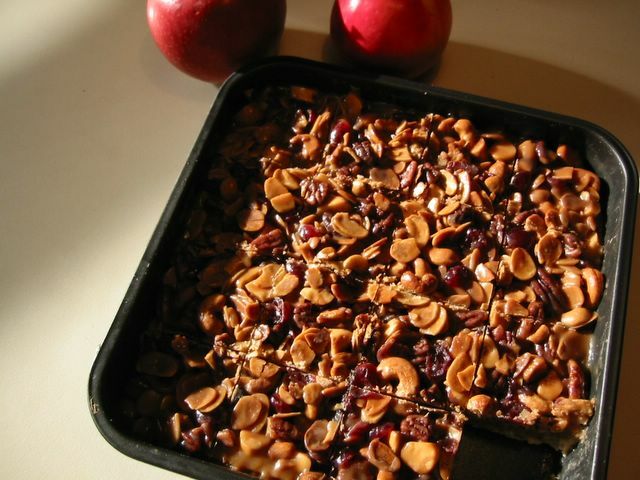 Cut into squares, thaw for 30 minutes, and serve with the whipped cream. Note: You may use any combination of nuts as long as they weigh 400 g in total. Thanks, mine doesn't look the same as the one in your pictures but tastes great!